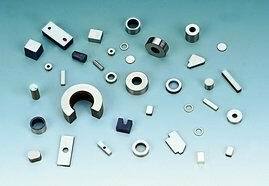 For more products information, please click "Information"
Alnico materials (composed predominantly of aluminum, nickel, and cobalt with minor amounts of other elements including titanium and copper) permit design latitudes providing high indications, high energies and relatively high coercivities. Alnico magnets are characterized by excellent temperature stability and good resistance to demagnetization from vibration and shock. Alnico magnets offer the best temperature characteristics of any standard production magnet material available. They can be used for continuous duty applications where temperature extremes up to 930F can be expected. Specialized casting techniques used to achieve the unique crystalline grain orientation found in the alnico 5 and 8 grades. These anisotropic grades are designed to produce high magnetic output in a specified direction. Orientation is achieved during heat treatment, by cooling the casting from 2000F at a controlled rate within a magnetic field which conforms to the preferred direction of magnetization. Alnico 5 and Alnico 8 are anisotropic and exhibit a preferred direction of orientation, Magnetic orientation should be specified on your drawing when you send an order to us. Cast Alnico 5 is the most commonly used of all the cast Alnico's .It combines high indications with a high energy product of 5 MGOe or more and is used extensively in rotation machinery, communications, meters and instruments, sensing devices and holding applications. The higher resistance to demagnetization(coercive force) of Alnico 8,cobalt content to 35%,allows this material to function well for short lengths or for length to diameter ratios of less than 2 to 1. Sintered Alnico materials offer slightly lower magnetic properties but butter mechanical characteristics than the cast Alnico materials. Sintered Alnico magnets are most suitable in small sizes(less than 1 oz. )in this process. The desired mix of metal powder is pressed to shape and size in a die, then sintered at 2300 F in a hydrogen atmosphere. The sintering process is well suited to large volume production, and results in parts which are structurally stronger than cast magnets. Relatively close tolerances can be achieved without grinding. *Maximum working temperature can be as high as 450oC~550oC. *Strong corrosion resistance capability, no coating needed for surface protection. • Excellent temperature stability (temp. coefficient of Br is the smallest among all of the other permanent magnets. European Office：Add:ARVEE UG (haftungsbeschränkt), Landwehr 65, 44534 Lünen, Germany.